TV Appearance: Interview for Heir Hunters discussing the role of the Auxiliary Territorial Service in the Second World War. TV Appearance: Interview for Heir Hunters discussing the role of the Women’s Land Army in the Second World War. Cherish and her sister on graduation day. Paper – Fellings, Photos, and Feelings: The Experience, Representation, and Memory of the Women’s Timber Corps (WTC). Bringing Conflict Home at the University of York. During the Second World War, forestry work provided one of the most substantial challenges to conventional gender roles on the Home Front as women undertook heavy, manual labour in British forests. Drawing on press photo collections and women’s life writings, this paper considers the experience, representation, and memory of the organisation as part of the wider cultural memory of the Second World War. 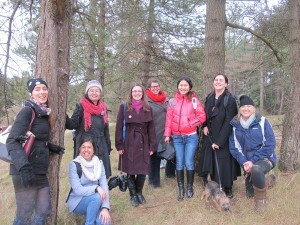 This paper examines how women’s forestry work was powerfully shaped by its landscape and how this posed particular problems in terms of representation and national identity. Tiia, Simon, Holly and Cherish represented the History to the Public team at the UCL ‘Belonging and Transgression’ conference held in London at the end of June. Here we share a summary of key points from our presentation, which looked at the benefits of blogging for young academics. Blog Post – #Somme100 – commemoration or appropriation? Tiia Sahrakorpi, Simon Coll, Cherish Watton and Richard Gunning explore cenentary commemoerations for the Battle of the Somme. Cherish being filmed for Heir Hunters in December 2015. 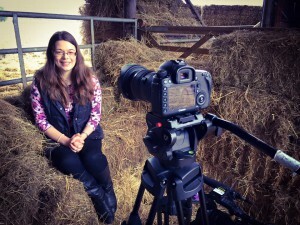 I participated in an interview for a feature on the Women’s Land Army for BBC Heir Hunters. The team tracked down Eileen Joan Berry, a Land Girl who worked in Warwickshire during the Second World War. As part of the team’s research into her family, I discussed the type of work women undertook and how Eileen’s work on the land was a complete change from her pre-war occupation as a invoice clerk. Blog Post – 18th century clerical households, the West End and politics: a dynamic Lent term! Blog Post – The 1920s: The Period of Radical Women? Blog Post – Sherlock’s ‘The Abominable Bride’: Abominable History? The Cavendish Chorale performing at Lucy Cavendish College’s Carol Concert in December 2015. Blog Post – Festive greetings to regular followers of the Lucy blog! Blog Post – What is Oral History? Blog Post – Learning From Journals: What can we Learn From ‘The Landswoman’? Blog Post – Nothing More Than Photo Opportunites? Blog Post – A response to the papers presented at The University in the Antropocene: Higher Education and Community Engagement in Environmental Management. Published on the GEES network website; a teaching-focused resource for academics in Geography, Earth and Environmental Sciences and Norfolk County Council’s Low Carbon Norfolk blog. 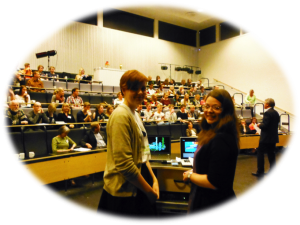 Bright Futures: Partnerships between Universities, Scholars, and Schools for Environmental and Social Sustainability at the University of Exeter for the RGS-IBG Annual International Conference 2015. Presented in partnership with Becca Farnum. Blog Post- How was the Women’s Land Army viewed in 1944? The Cavendish Chorale at an away day in Norfolk, who performed their first concert at St Edmund’s chapel on the 30th April 2015. Blog Post – The Start of the Easter Term! A 5-minute snapshot talk at Lucy Cavendish College, in honour of International Women’s Day. 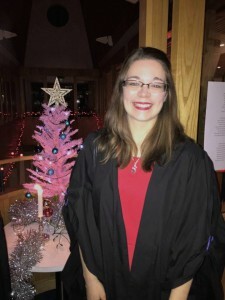 Blog Post – Halfway Through?! 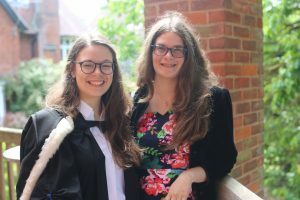 First-year historian Cherish bids adieu to the Michaelmas term in her blog post for the Lucy Cavendish website. 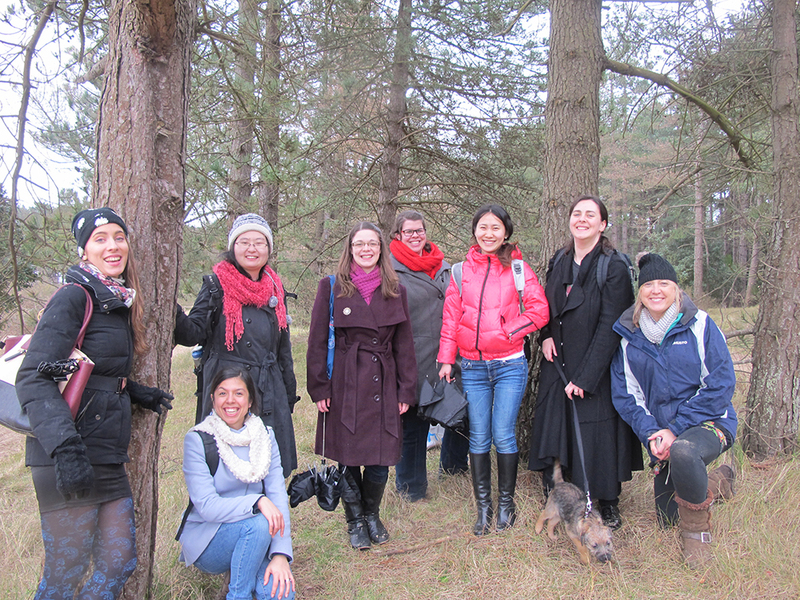 A piece written by Rebecca Farnum and Cherish for ‘Beyond 2015’, exploring university engagement with environmental residential programmes. This dialogue is a companion to Cherish’s presentation to Beyond 2015, addressing Question 4: What partnerships should universities establish to achieve their objectives? An article Cherish advised on, detailing the work of the Land Girls of World War One for Pride Magazine, a local magazine for the areas of Market Harborough, Kettering, Corby and Oundle (p.90). An article written reflecting on her journey into business and what she has learnt during 3 years in business. Prezi – A visual journey of Cherish’s journey into business. Ellie meets historian Cherish who explains how propaganda was used to entice city women out to farms. Once in the countryside they had to get stuck-in but were rewarded with liberating trouser uniforms and usually found themselves to be more than capable. Ellie is shown photos of Valerie Linder’s mother Dorothy who described her time working for the Land Army as “the happiest days of her life”. Cherish was invited to present at the Energy Education Celebration Event at Oxburgh Hall on the 25th November 2013. Cherish presented on her journey into business and how participating in the eFutures programme at Northgate High School and Dereham Sixth Form College led her to set up in business as an eco-consultant. Cherish shared her experiences live on BBC Radio Norfolk. Video – A video summary of their presentation. A presentation by Cherish and Malene Melbye exploring their work on the international partnership project, VENN at the Learning Beyond The Classroom, VENN Conference, Dahlske School, Norway. Freddie McCarthy and Cherish greeting the Crown Prince of Norway at the Opening of the Sheringham Shoal Offshore Wind Farm. Article – What does the green economy mean for you? A piece written for young people exploring the opportunities which the green economy can hold for their future. A letter written by Cherish Watton and Dr David Wilson on the Women’s Land Army published in the September 2012 edition of BBC History magazine. Cherish’s recount of attending the opening of the Sheringham Shoal Wind Farm by the Crown Prince of Norway. Cherish was interviewed by Katie Martin on BBC Radio Solent, discussing the World War Two Women’s Land Army.